We bring you last week's top former Lakers players who are currently playing in pro basketball. #1. Brandon Robinson (6'6''-SG-89, graduated '11, plays pro in Chile) led Las Animas to an easy victory against the sixth-ranked Universidad Catolica (1-22) crushing them 108-71 in the Chilean Liga Nacional last Saturday. He had a double-double by scoring 17 points and getting 10 rebounds. 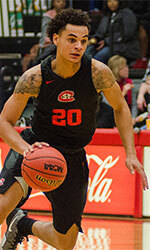 Robinson also added 5 assists (was perfect 7-for-7 from the free throw line) in 25 minutes. Club Deportes Las Animas (16-6) is placed first in Conferencia Sur. There are only two games left until the end of the Regular Season. So now every game will be critical. It's Robinson's first season with the team. He has individually a very good year with high stats. Robinson averages 23.4ppg, 6.7rpg, 3.7apg and 2.8spg in 21 games he played so far. #2. 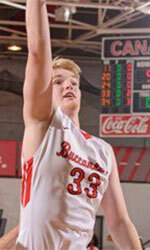 Richard Bell (6'9''-F/C-91, graduated '16, plays in United Kingdom). Bell could not help Manchester Magic (8-5) to beat Knights (5-8) in the British NBL D1 (second division). He scored 9 points and grabbed 7 rebounds. But Manchester Magic was crushed 83-58 on the road by the lower-ranked Knights (#10). Bell has relatively good stats this season 12.3ppg, 8.8rpg, 1.8apg and 1.2bpg. #3. Experienced Jonathan Beugnot (6'7''-PF-83, graduated '07, currently in France) was not able to help Feurs EF in their game against Sorgues BC (10-9) in the French NM1 (third division). It was not his best game last Saturday. Beugnot recorded only 2 points in 19 minutes. The ninth-placed Feurs EF (8-11) was edged 80-79 in Sorgues by the higher-ranked (#6) Sorgues BC in the Group A. It was Feurs EF's fourth consecutive loss in a row. It's Beugnot's sixth season with the team. This year he averages 6.9ppg, 5.2rpg and 1.5spg in 16 games. #4. Takija Knight (6'8''-PF-94, graduated '16, plays pro in Armenia) was not able to secure a victory for Artsakh (6-9) in their game against Artik (8-5) in the Armenian League A. He scored 7 points, had 10 rebounds, passed 4 assists and added 3 blocks. Artsakh was edged 87-85 on the opponent's court by the higher-ranked Artik (#3). Knight has relatively good stats this season 13.3ppg, 10.9rpg, 2.7apg, 1.3bpg and 2.1spg. Knight is a former Eurobasket Summer League player, which is considered top international summer league in the market.